Preston North End vs. Chelsea : 23 January 2010. I left my village at 6.45am. I was well aware that there would be a So-Cal “get-together” at 4.45am in Santa Anna, so I texted Andy Wray to let him know I was “on the road.” He was off to bed, but we’d talk later. Over the years I have been to around sixty grounds in England and Wales, plus ten in Scotland – not always watching Chelsea…maybe twenty-five games not involving us. Like a lot of Chelsea of my generation, I am desperate for new grounds to add to the list. So, I was dead happy that we drew PNE in the FA Cup this year. Chelsea last visited that particular part of Lancashire in 1981. My only visit to Preston in my life was in 1996 on a coach headed for Edinburgh ( I remember trying to locate – successfully – the Deepdale floodlights ) and so this was going to be an enjoyable one for me. I collected Parky, the old dog, and was soon headed past Bath onto the M4. Dawn eventually broke at around 8am as we headed up the M5 through Gloucestershire…the motorway was quiet. The chat was surprisingly about the game during the first hour. Danny Baker was on the radio, chatting away in that blokey-style of his…a beguiling mix of football, popular culture and humour. At Cannock, we pulled off the M6 and had a massive fry-up at “The Hollies” transport cafe. Transport cafes are our answer to the American roadside diner, much beloved by Hollywood directors. However, the ones in the UK tend to be drab, grimy and austere. I would imagine that few tourists are inspired to drop in to them on their travels around this green and pleasant land. However, for £5 we were served a plate fit enough for a king…bacon, sausages, beans, black pudding, fried bread, hash browns, a sunny-side up fried egg ( no choice…no “over easy” over here! ), mushrooms, plum tomatoes, toast and a cup of Rosey Lee. A ”Full Monty” if ever there was. We continued our drive north. The mist was clawing at my car, slowing my progress. Thirty miles out of Preston, we passed two Chelsea coaches and I pulled ahead of the one in front. A quick call to Alan and Gary, and they saw Parky wave to them, before I sped on. Five hours after leaving my sleeping Somerset village, I pulled into a quiet housing estate close to Deepdale. Although this was the first time I had visited Deepdale, through a succession of books on stadia design, I have kept in touch with the redevelopment of Preston’s ground. The first new stand was finished in 1996 and, at the time, was so different to the remaining three stands. The old West Stand, dating from the nineteenth century was a quirky museum piece, with roof supports every few yards. Since then, three other new stands were added, the East Stand only recently. It’s now a trim, modern stadium, well appointed with a few nice touches. Ultra-modern floodlight pylons at each corner give the stadium a European feel. It is said that the architect took his inspiration from the stadium in Genoa. Three of the stands are named after former players…Tom Finney, Bill Shankly and Alan Kelly. Mosaics of the three players are picked out on each stand, using coloured seats. This is unique in the UK, perhaps in the world. Another nice touch. The third, East Stand, is named after the all-conquering Invincibles team of 1889 ( they went unbeaten throughout the season ). So, Preston has a proud history. No doubt. They used to be regulars in the top flight until the ‘sixties. As I entered the Bill Shankly Stand, I noted that the original turnstiles were still being used – the wrought iron “click-clicked” as I went through. Somebody must have made the conscious decision to save them from the original stadium. Another nice touch. Time for one beer in the crowded concourse and then, with five minutes to go, up into the seating area. I was right behind the goal, halfway back. My seat colour was beige. I would be standing the entire game on Bill Shankly’s face. The Liverpool-haters amongst our support will approve. The mist was still hanging in the air and the floodlights were on. The game? I think the game could be summed up by the phrase “we did enough.” We had lots and lots of the ball, but Preston defended resolutely. They were happy to let us attack them. I was stood next to my mate Andy from Nuneaton and we both noted the ample girth of their left-back. I was surprised how quiet the home fans were. A little section of the Invincibles Stand was quite gobby, but in their midst were a few teenage girls, giving us rude hand-signals. We enquired of the girls’ sexual preferences and they were warmly applauded! We had a disallowed goal, then another Alex rocket of free-kick. Preston came close with a couple of close- range efforts. After a while, I said to Andy “it’s almost as if we need to entice them in to create space.” Almost immediately, Deco gave away a cheap free-kick and Preston pushed up to support the attack. The move broke down and with a rapid succession of passes, Ballack found Anelka. He sped into the box and scored. He seemed to hit the ball right through the ‘keeper. The 6,000 away fans yelped in approval. It was a textbook break. At half-time, I noted he was four yards away. The World’s shortest ever text message journey! 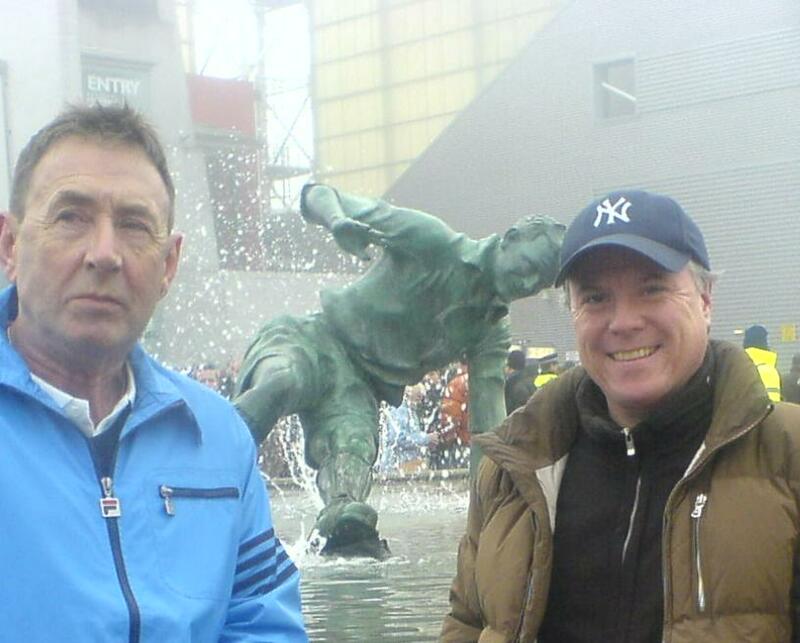 I met up with Ajax who thankfully bought my Everton away ticket ( midweek – I’m unable to attend ). Soon into the second period, Daniel Sturridge pounced on a loose ball from a corner and we went into a 2-0 lead. Although a two goal leads is not always easy to maintain, Preston never looked like causing us further harm. Two-nil and coasting. The only problems from the game were the injuries to Juliano and Frank. Midway through the second-half, a few lads to my right unravelled a plastic banner measuring 15 feet by 8 feet which remembered Chelsea fan Gary Lee, who sadly died after the game in 1981. I believe he was chased by some Preston fans and fell to his death from a multi-story car-park. The banner read. Gary Lee RIP – Never Forgotten. It was passed overhead for twenty minutes. A nice touch indeed. However, one thing annoyed me. Once or twice in the game, the away fans sang “You are 5hit – you are 5hit” to the Preston fans. Preston are a struggling provincial Championship team. We are multi-millionaires with Champions League aspirations. The goading of Preston seems to me to be a bit crass and classless. In my mind, it mirrors the school bully hitting a weak kid. No need for it. I remember we sang the same thing to Gillingham a few years back. If we play a non-league team in next year’s FA Cup, will we sing the same? We need to be a bit more discerning I think. Sing it to Tottenham or Arsenal, for sure. Not Preston. The home fans were eventually stirred during the last minutes of the game and the home end sang their unique “PNE” chant. The gate was over 23,000 and was one of only a few full-houses on this day of the Fourth Round. This is sad. In my youth, the FA Cup drew around 50% more than the usual league games…these days it seems to be 50% less. I have many reasons for this – too many to mention – but I think the FA has miss-managed the FA Cup over the years. A real shame. Derby were watched by only 11,000 in the FA Cup, whereas 24,000 were at Sheffield Wednesday in the League. Bolton only drew 14,000 but are regularly watched by 22,000 in the League. Everton 30,000. And so it goes on. The only other full house was at Tottenham. Parky and myself listened to the other Cup games on the radio on the drive south. As I was nearing home on the M4, in the last minute of the game at White Hart Lane, the referee awarded Leeds a penalty. I punched the air and my car momentarily swerved in joyous euphoria. When Beckford slammed it in, we yelled out…it was the end to a great day in FA Cup Land. We don’t like Leeds, but we hate Tottenham. We envisaged Spurs being run ragged ( on and off the pitch ) at Elland Road on a cold, dark, desolate Wednesday evening in ten days time and we smiled a deep deep smile. It brought home to me how much I hate Tottenham. There would be nothing worse than losing to Spurs in the FA Cup. I wanted them out. We scanned the remaining teams left in the Cup and, from a purely selfish perspective, we agreed that an away trip to Cardiff ( 50 miles away ) or Southampton ( 60 miles away ) would be our preferred choices. We could even go by train to these two cities. After 458 miles, I reached home, tired and weary. It had been a long day on the road. With United winning, we were down to third place, but my thoughts were on Wembley, or at least Cardiff, Southampton…and Leeds. This entry was posted in Season 2009-2010. and tagged 2009-2010, FA Cup, Sir Tom Finney, Songs, Stadia by Chris Axon. Bookmark the permalink.